The Dialogue’s approach is bold, inclusive, diverse and innovative – like the people of Western Sydney it represents. Christopher is Pro Chancellor of Western Sydney University and Chairs the WSU Board's External Affairs committee and its elite Academy program - and recently retired from the boards of ANZ Stadium, Moorebank Intermodal and LUCRF Super. Having served on dozens of government boards over 30 years, he was a member of the Federal/State commission that chose the Badgerys Creek Airport site and then devised an advocacy campaign to secure Cabinet support. He served on the NSW Transport & Planning Blueprint Panel that first recognised Parramatta as Sydney’s second CBD and advises News Corp's 'Go West/Project Sydney' editorial campaign. Christopher chaired the WestLine Partnership, which secured a light rail connection in the Olympic Corridor, and the Western Sydney Rail Alliance, which secured $5+ billion to build north/south rail connections to Badgerys Creek. He was founding Convenor of the Parramatta Partnership Forum and the Committee for Liverpool, and now manages the Canterbury-Bankstown Forum and Advance Blacktown civic leadership forums. He chairs the South West Sydney Local Health Advisory Board and served as an adviser to the Western Sydney Parklands. Raised and educated in Parramatta, he was awarded Australian Honours for services to industry and community in 2014. Luke joins the Dialogue from the NRMA and previously worked for the Tourism and Transport Forum, the NSW Department of Family and Community Services and the City of Sydney. He has a Masters of Public Policy from the University of Sydney and a Bachelor of Communication from the University of Newcastle. Brett brings 15 years of sales, marketing and stakeholder management experience to the Western Sydney Leadership Dialogue. He recently delivered the BOOMTOWN! Summit for 400+ delegates, project managing budgets, suppliers, attendees and speakers, and will project manage Out There, an ideas-based policy forum supporting Sydney's West. Sarah adds 20 years of positive strategic media management, news sense and stakeholder liaison, across a range of sectors, to the Dialogue. She has worked as journalist, production manager, producer and held a range of marketing roles, where her ability to reach and interact clearly with target audiences has resulted in many successful outcomes. Sarah is experienced in government media issues management, risk reputation in the corporate and not-for-profit sectors, branding and PR and been responsible for driving positive strategic change. With sector experience in diversity, inclusion, employment, OH&S, environment, education and consumer PR, Sarah is a strategic story-teller who helps people, businesses and communities share their message. 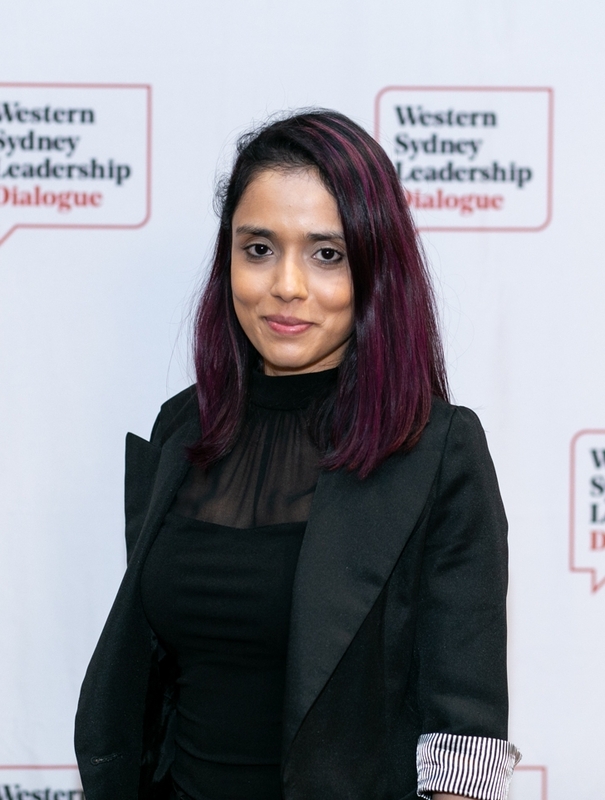 Western Sydney University Academy Student (and Advisory Board member) Lauren Nicholls, who is currently completing both a Bachelor of Planning and Bachelor of Applied Leadership and Critical Thinking, has recently joined the Western Sydney Leadership Dialogue as its Policy Officer. Lauren's passion for social justice, and enthusiasm for addressing inequality, along with a vast array of leadership roles, including as an Executive Member of Social and Community Workers Western Sydney and as a representative on the NCOSS Young Women's Round Table are just some of the many qualities that she'll bring to her role with the Dialogue. Marushka comes to the Western Sydney Leadership Dialogue with over 8 years’ experience in the events management industry. After 6 years in the conference space, and working alongside business and marketing gurus, she moved to the digital events sector where she built her technical knowledge and client facing skills. Born and raised in Bankstown, Catherine is a recent graduate from the University of Technology Sydney, joining the Western Sydney Leadership Dialogue team from a range of roles in administration, marketing and event management. Catherine joins the Dialogue as the Events Coordinator and is responsible for delivering a range of initiatives, from the VIP Boardroom Dinner series and industry workshops, to our signature policy Summits, BOOMTOWN! and Out There.